It is very important to monitor the temperature in your brooder for about the first 3 weeks. Around that time is when chicks will begin getting their true feathers which help them to control their own body temperature. 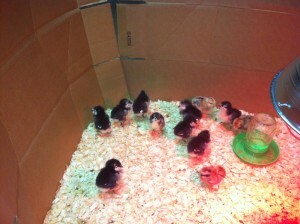 For the first week, keep the brooder temperature between 90-95 degrees. We use a brooder lamp and hang it about 18 in. or so from the bottom of the brooder depending on how many watts the light bulb is. A red light bulb will help decrease the tendency of the chicks to peck at one another. Set up the lamp so that it can be adjusted up and down to increase or decrease the temperature of the brooder. We put a cheap thermometer on the floor of the brooder, directly under the lamp to monitor the temperature. Reduce the temperature of the brooder by raising the lamp an inch or so. You will want to reduce the temperature by 5-10 degrees per week until the brooder is at a temperature of 70 degrees. This allows them to gradually acclimate to cooler temperature they will experience outdoors.